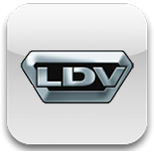 All LDV vehicles manufactured for the UK market after 1998, by law, must be fitted with an immobiliser system. This system prevents an unprogrammed key from starting the vehicle and therefore reduces the risk of vehicle theft. Almost all LDV keys can be cloned, at Devon Car Keys (part of Devon Security) we have specialist equipment to allow the information from your existing key to be transferred onto another key, thus making a spare key easy to obtain. LDV keys are similar to the Chubb AVA system, these keys require specialist equipment to duplicate which not all auto locksmiths carry. At Devon Car Keys we carry this equipment in our mobile workshop, making key production quick and easy.